Thereis no place on Earth that is a perfect copycat of Mars as it is now, oras itwas at any specific point in the past. But scientists suggest Earth haslittleversions of Mars as it might have been over decades. Theseplaces could help scientists develop a timeline of the Red Planet'shistory. Byproviding insights on how Mars has changed over time, these terrestrialmimicscould help us better understand the results of past and currentmissions toMars. They also could help researchers plan future expeditions to lookfor signsof life on Mars. In addition, investigating these extremesites on Earth couldshed light on the limits of life. AstrobiologistAlberto Fairen at the SETI Institute and NASA AmesResearch Center and his colleagues identified three stages Mars wentthrough. Inthe first, cold, wet age, enough liquid water and energy waspresent to make Marspotentially habitable. In the second "Snowball Mars" age,conditions became extremely challenging, and the liquid water thatcould havemade life possible became scarce. Inthe current hyper-arid age, conditions on the surface havebecome largely uninhabitable, save perhaps some isolated niches. "Wehave tried to assign every analog to a specific time in Mars'geologicalhistory, so we can study the evolution of Mars in Earth environments,"Fairen explained. "Thiswill be the only way to ask ourselves the rightquestions." Theirresearchwas detailed in the November issue of the journal Astrobiology. Mostof the water-linked features and mineral deposits seen todate on Mars stem from this first age. The largest part ofthe surface wascomposed of volcanic rocks and related soils, which the surface watersreactedwith to generate a variety of minerals. These include phyllosilicates,whichare typical products of the weathering of volcanic basalt, andevaporites,deposits that form after the upwelling and evaporation of groundwater. Foursites on Earth mimic rocks from this age on Mars. They couldyield insights not only into the chemistry that dominated the surfaceof the RedPlanet back then, but also into the potential for both life and thepreservation of traces of life. TheNorth Pole Dome area, which covers some 230 square miles (600square km) in the 3.5-billion-year-old Pilbara region of WesternAustralia, isan excellent analog for Martian phyllosilicate formation, theresearchersnoted. It also contains evidence of Earth's earliest biosphere in theform ofstromatolites and possible microfossils more than 3 billion years old,andtherefore could shed light on how any Martian fossils might have beenpreservedor degraded over time. Whenit comes to evaporites, acidic environments on Earth couldserve as compelling analogs for acid sulfate-rich regions such asMeridianiPlanum on Mars, including seasonally dry, acid lakes in WesternAustralia, theRio Tinto basin in Spain and cold acid drainage systems in the CanadianArctic. Theseacidicenvironments on Earth are either rich in microbes or possessevidence ofmicrobial activity, and as such could shed light on Meridiani Planum,which isconsidered a prime target for the search for any organic material thatlifecould potentially have left on Mars. AsMars became increasingly dry and cold some 3 billion to 3.6 billionyears ago,its water froze, leaving its surface nearly or entirely frozen. Thedisappearance of the planet's magnetic field and the surface'sincreasing coldand aridity probably made it dramatically less habitable overall. Still,there was massive volcanism, leading to episodic inundations of largeparts ofthe lowlands, which might have provided favorable conditions for thepreservation and evolution of life. The prevailing conditions on thesurfacethen were probably similar to ones seen at polar regions on Earth,includinglarge ice sheets and glaciers. Astrobiologistslooking for lessons on Mars are especially interested in how microbesand signsoflife on Earth are preserved for long spans of time in ice,and howmicroorganisms deal with the rigors of arctic conditions and impacttheirenvironment. Ice and permafrost on Earth are known to hold a largenumber ofviable microbes up to 8 million years old, with permafrost bacteriashowingmeasurable activity down to at least minus 4 degrees F (minus 20degrees C),and that survival could even extend to at least minus 40 degrees F(minus 40degrees C). Threeanalogs on Earth for "Snowball Mars" include Axel Heiberg Island inthe extreme northern regions of the Canadian High Arctic, Beacon ValleyinAntarctica, and the North Greenland Eemian Ice Drilling Project site. Thepermafrost at Axel Heiberg island is analogous to Martian permafrost;Greenlandis a good analog to the martian north polar layered deposits,exhibitingsimilar patterns when it comes to accumulations of material, and the upto10-million-year-old ice of Beacon Valley might be the oldest known iceonEarth, and as such could shed light on anything preserved for longtimes onMars. Althoughthere are no places on Earth today akin to the arid and cold conditionsseen onMars today, there are two areas where liquid water is extremelyfleeting. Inthe Atacama Desert in Chile, the heat makes water vaporize, while inUniversityValley in Antarctica, the water freezes. Inthe Atacama Desert the soils are very old, up to 2 million years inage, aswell as extremely dry and enriched in soluble salts similar to thosefound onMars. The soils also possess very low levels of bacteria and organicmaterials,providing a way to study the rigors any Martian microbes might face. Anotherway the soils in the Atacama Desert mimic Martian ones lies in how theypossesslevels of perchlorates nearly as high as those seen by the Phoenixlander onMars. These were likely created by sunlight-induced chemical reactionsin theatmosphere. Therehave been decades of debate over how warm, cold, wet or dry Mars hasbeen inthe past, and not everyone agrees with the timeline that Fairen and hiscolleagues set forth. Forinstance, during the earliest age of Mars, which Fairen and hiscolleagues setforward as cold and wet, "I don't think you can create the kinds offeatures that they see without a much warmer climate than theypropose,"said planetary scientist James Kasting at Pennsylvania StateUniversity, whodid not participate in this study. "I don't believe in a cold, wet Mars?I think it was warm and wet in the distant past, and I think climatemodels forMars bear that out. That doesn't mean that it was as warm as the Earthistoday, but that mean annual temperatures were above the freezing pointofwater." Fairennoted that it was "difficult is to know if the planet was warm or cold.Atmospheric models are unable to raise the temperatures on the surfaceoverzero degrees C (the freezing point of water) whatever the concentrationofcarbon dioxide assumed, so additional gases must have contributed towarm earlyMars. Whichgases did this, and what their concentrations were, is something thatstill needsto be determined, so the 'warm' model for early Mars lacks solidevidence.Alternatively, salty solutions could have kept liquid on Mars attemperaturessomewhat under the freezing point of pure water, for a cold and wetMars." Regardlessof the arguments over how warm or wet Mars was in thepast, planetary scientist Victor Baker at the University of Arizona,who didnot take part on this study, felt the timeline would help motivateresearch. 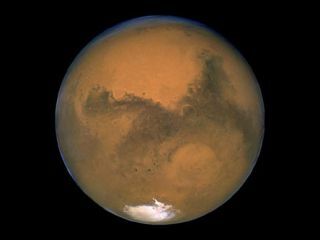 "It can help us understand particular periods in Martian history andformulate strategies on where to go and search for life," he said. "They're presenting the idea that we have to think of Mars as a wholeplanet evolving through time, and as something that we can look at onEarth." "Ifpeople don't like the timeline, that's a positive thing,too ? they can go out and find hard data that the timeline is wrong,and thencreate a better one, and then science can move forward," Baker added. "This framework they propose is not absolute ? it's a working idea.They're not saying this is absolutely the way Mars is, but that this isa waywe can think of it as a strategy to learn more about the planet, andit'ssomething we can revise as we move along." Thisstory is presented in cooperation with AstrobiologyMagazine, a web-based publication sponsored bythe NASA astrobiologyprogram.